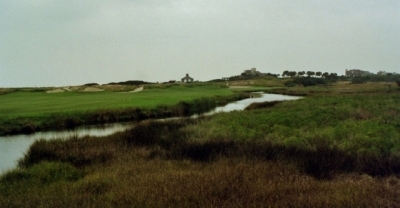 KIAWAH ISLAND, SC – “It was the hardest golf course I’d ever seen when we came to play it in ’91,” remarked CBS Golf Commentator David Feherty, remembering back to his Ryder Cup appearance in 1991 as a member of the European Ryder Cup Team. Our caddy described every tee shot on the Ocean Course -- and he said it doesn't get any easier than on number one. Scary. 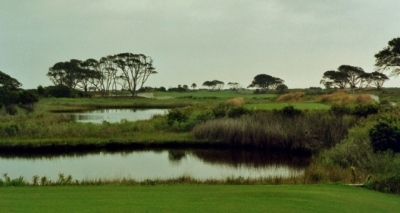 The ‘it’ in this case is the Ocean Course at Kiawah Island Golf Resort, the Pete Dye inspired torture chamber for golfers that opened shortly before hosting the Ryder Cup – it was supposed to be hard, and it was… or should I say, still is. The Ocean Course has been softened considerably since the Americans took on the Europeans – the famously coined ‘War by the shore’ -- yet remains one of the most difficult tests of golf on the planet, and probably the most challenging layout this reviewer’s ever seen. From behind the par four 15th hole. Medium in length, maximum in scenic quality. It’s harder to put it any more apropos than that – the Ocean Course will beat the snot out of even the best golfers, but you’ll still leave feeling exhilarated… and dare I say, dying to go back? That being said, it’s also quite friendly to the white tee (there are actually two choices here, the Dye tees at 6475 and Carolina tees at 6202) golfer, as I found out upon retreating from the Ocean tees after about the third hole. In typical Dye fashion, the fairway landing areas are more than generous, and if you can manage to avoid the wildly abundant trouble to the sides of the playing areas, you’ll actually find you can navigate around the place. Looking from the tee of the par four 9th hole. Dye always designs challenging holes to conclude every nine, and this one's certainly no exception. As Feherty noted, the greens are raised with some pretty sensational short-mowed chipping swales and massive sand bunkers surrounding the putting surfaces. If you miss here, don’t be surprised if you’re staring up twelve to fifteen feet to the level of the green, not to mention the top of the flagstick. There are only a token few carries from the advanced sets of tees, but if you venture farther back, watch out. You could find a bite out of your trousers, and we’re not even talking about the abundant collection of alligators here, either. The bane of the American team during the 2003 World Cup -- the par four 13th hole. Jim Furyk's tee shot ended up in the water, and the team never recovered. It’s unique in another way. Though it’s probably not the only golf course under construction that’s ever been wiped out by a hurricane, it might be one of the few where the builders had to completely start over after Hurricane Hugo blew through in 1989. 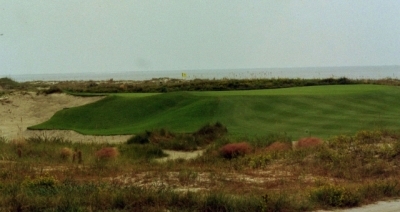 Pete Dye came in with a bulldozer and re-established all the primary dunes along the golf course – and in the process, designed and built the Ocean Course. Dye’s eternally reluctant to name a favorite golf course that he’s designed, but the trying circumstances under which the Ocean Course was constructed certainly must rank it high up in his estimation. It’s always hard to start over, but maybe the second chance led to even greater accomplishments. A ray of sunshine highlights the green on the par five 16th hole. If the wind's right, it may be the best scoring chance you'll see on the back nine. That’s because the back tees stretch to over 7,800 yards. The scorecard lists the Tournament set at 7,356, but Warren says the farthest back tees were part of the original design, and have always been there (they’re just not used). The Tournament tees’ slope is a tad wimpy for a course of this stature at 144, but the 77.3 rating will get your attention. The card doesn’t list the slope & rating at the both-barrel length, but here’s guessing it’s well over 150 and probably on the high side of 80. Ouch. Our forecaddie, Elijah Roberts, said you’ll need special permission from the head pro to even play from the Tournament set, and in all his time there, has only seen it done a few times. But even then, the Ocean Course always wins. Roberts is a pretty fair golfer himself (played college golf), and said he wouldn’t even think about playing farther back than the Ocean tees (6,744 yards). You're wondering where to aim off the tee of the par five second hole. Warren said it might be the most visually intimidating course you'll ever see, and this is why. 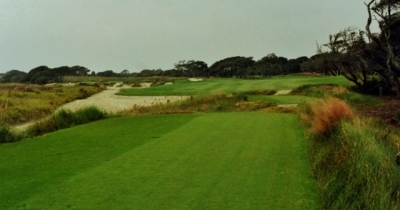 Warren mentioned that although the course can play in the upper 7,000s, to date it never has been and probably never will, due to the prevalent wind that relentlessly pummels the seaside layout. “With the wind, this course could play like 8,500 yards, and it’d be impossible.” In 2003, the South African team managed to shoot 13-under 275 at the WGC World Cup, so maybe the 7,300 yard distance is still manageable, at least to the best players in the world. 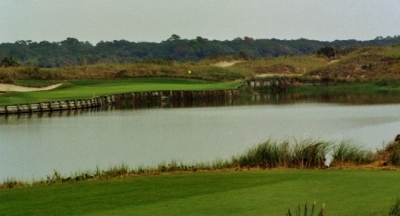 The course also hosted the 2007 Senior PGA Championship. Warren says the difficulty of the course changes from day to day, because the wind can turn around 180 degrees within the course of an afternoon. And depending on the angle of the wind, the tee shots can become different off each tee. David Feherty's favorite hole, the par three 17th. It was probably our favorite, too. “Then, if the wind’s blowing hard, you have to use so many shots that you don’t normally hit – to play a long shot into a bank to let it roll up. You either have to hit a low shot into the wind, or a shot to control with the wind, or with a cross-wind. Because it’s right on the ocean, the wind’s a constant factor when you play golf here,” Warren added. The forecaddie (or caddy, should you choose to walk) is another constant at the Ocean Course. His fee is included in your greens fees on the Ocean Course, and it’s mandatory for first-timers (and highly recommended even for veterans). 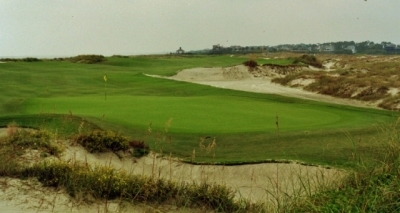 Warren says they’re moving towards making the Ocean Course mandatory walking, and taking a caddy is part of the tradition of the game – not to mention he’s invaluable in pointing you in the right direction off the tee and telling you when to drop another ball when the inevitable result of your previous try is hopelessly gone. 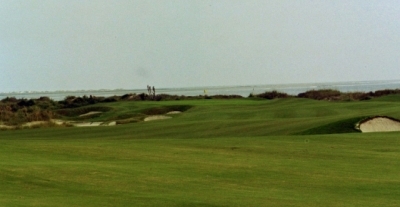 Take our advice -- if at all possible, stay out of the sand on the Ocean Course, but especially on the par four 6th hole. There aren’t any paved cart paths on the course, and if you choose to ride, you’re probably going to end up staying to the sides on the hard sand throughways that double as enormous waste bunkers. In addition, there isn’t any out-of-bounds on the Ocean Course, so if you can find your ball, you can play it. And all the bunkers are deemed waste bunkers (or not hazards), so feel free to ground your club all you like, all the way to the green – but don’t try to beat the sand to death out of frustration, because you’ll lose that battle, like all the others. Sand feels no pain, unlike your wrists. And after all, it’s not the sand’s fault. Keep things in perspective. The green of the par three 8th hole looks like it's on a plateau... because it is. It's like an island without water. You can also take comfort in the fact that the course is easier than it used to be, thanks to some early decade changes. “Dye came back in 2002 and ‘03 and did some tweaking on tee placements. He also moved the 18th green about 30 yards to the right, closer to the ocean, so the ocean’s more of a backdrop to the second shot there. He also re-shaped the greens and we re-grassed them. Then there were some maintenance things like re-establishing a lot of drainage in all of the waste areas and what not. So right now, it’s as close to perfect as a golf course can be in terms of functionality and design,” Warren said proudly. All of this, and the Ocean Course still qualifies as enviro-friendly. “This is a terrific example of a golf course that was built with all the environmental elements as a primary concern. Since you’re on the ocean, you have a federal line that you cannot cross, to the ocean side of it. Then, with all the fresh and saltwater marshes, and how they can’t intermix, and all the wildlife with the gators and the waterfowl and other animals out there… it’s an environmentally sensitive area, and the golf course respected that, and works its way through in a way that preserves the natural setting, while at the same time providing people a great opportunity to play a golf course right next to the sea and the marshes without intruding on it,” Warren said. If you are not on the green of the par three 14th hole, you are likely in trouble. Highlights on a world famous course are many, as you’d expect. Dye’s done a masterful job of mixing in right-to-left holes, left-to-right holes, and different par three lengths. To employ an overused phrase, you’ll use every club in your bag to hit a wide variety of golf shots. The third hole is a relatively short 367-yard par four (from the Ocean tees), with the inevitable tee shot over a marsh to a wide fairway. Depending on your tee shot, you may have to contend with some skinny trees on your approach – but the real distinguishing feature here is the perched, almost table-top green. If you’re not on top, use your imagination to play it up there – anything from a putter to a lob wedge. On the back side, the 13th hole is a great par four (371 yards). Tee shots play over water to a wide fairway – again, plenty of landing area for the ball, unless you try and cut off too much of the slight dogleg right. This is the hole that cost the American team of Justin Leonard and Jim Furyk during the 2003 World Cup, when Furyk put their tee ball into the water on the right. They moved the 18th green closer to the water in 2002. Pete Dye thinks it's the best par four on the course, and it's hard to argue, though you may be so exhausted by this time that you won't appreciate it. 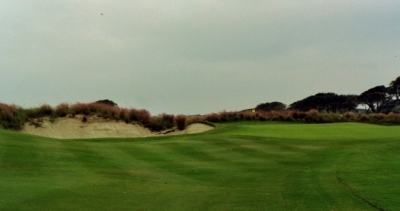 The 14th hole is a memorable par three, set right next to the ocean with the howling wind coming from the right. The green is large but it’s very steep down all sides if you miss – I know from experience. The 17th hole was Feherty’s favorite, and is probably the most famous hole on a very famous course – a 197 yard par three (again, Ocean tees) with a full water carry. Scary to face that shot so late in the round, that’s for sure. Needless to say, we didn’t face the 17th hole with the Ryder Cup on the line, but after such a difficult trip around an extremely challenging golf course, it was still an adventure, nonetheless. The Ocean Course is one of those where you’ll go in with a set of expectations, and they’ll be met in every way. You’ll think it’s going to be tough, and it is. But you’ll think it’s a chance to play a legendary golf course, the kind that only comes along a few times in a golfing lifetime -- and it’s that, too. All in all, an exhilarating pounding, one that you won’t soon forget. Note: Our great appreciation to David Feherty for sharing his thoughts on the Ocean Course with us. He always paints things in a unique way that only he can describe. Note: Check the links below for reviews of the other courses at Kiawah Island Golf Resort, as well as a preview of the accommodations.